Deviated Septum Rhinoplasty - Possible Sleep Apnea Cure? The most important cause for the sleep apnea is an anatomical deformity of the bone and cartilage that separate two nostrils, called deviated septum. If your septum is slanted to one side due to a congenital or trauma factor, your breathing might be obstructed, you might suffer from chronic sinus infections, nose bleeding, headaches and have difficulty sleeping. 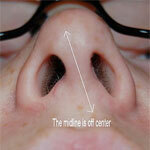 Deviated septum rhinoplasty is the most common procedure recommended for sleep apnea cure. Septorhinoplasty procedure combines the surgical dissection of the excessive bone and cartilage tissue and desired cosmetic improvements to the shape, size and appearance of the nose. Depending on the condition of your septum and the desired final result, your doctor might perform a closed rhinoplasty procedure and place incisions on the inside of your nose making scars virtually invisible. Rhinoplasty swelling and recovery times are significantly reduced in this case. Unfortunately, the innovative methods of nose improvements like non surgical rhinoplasty will not help you with your sleep apnea causes as it only corrects cosmetic nasal defects by injecting various fillers and materials to make your nose look more proportional. Deviated septum rhinoplasty will often be covered by most insurance companies as this procedure is a medical necessity for some people with sleep apnea and other conditions to help them breathe easier. Patients with sleep apnea are considered high risk group for deviated septum rhinoplasty and are being closely monitored before and after surgery for the breathing problems.